Manny is a true “Mr. Do-It-All.” He’s a pop star/boxer/icon/politician/roof cleaner/babysitter/marathon runner/cab driver in the Philippines. So when Manny decided to cover Dan Hill’s classic “Sometimes We Touch” and release it commercially, he wanted the world to see his musical prowess. Because of who he is and the hype surrounding the Pac Man, many fans logged into their iTunes account and purchased the song without ever hearing it. In turn, the song skyrocketed to number 7 on Billboard’s Secondary Adult Contemporary Chart. Then…people began to actually listen to Manny’s singing. Needless to say, it didn’t receive the most positive of responses, leaving fans to urge Manny to stay within the confines of the boxing ropes. We could blame Saturday’s loss on the possible depression that Manny suffered as a result of his lacking vocal talent. Freddie Roach is Pacquiao’s trainer. His right hand man. Bob Arum is Pacquiao’s promoter. Both men are instrumental in Pacquiao’s success. Although both men are close to Pacquiao, things got a little weird when Freddie Roach wanted to get a little closer to Bob Arum. Bob really didn’t appreciate this, prompting him to go to the judges and stage a split decision in Bradley’s favor, no matter how the fight went. 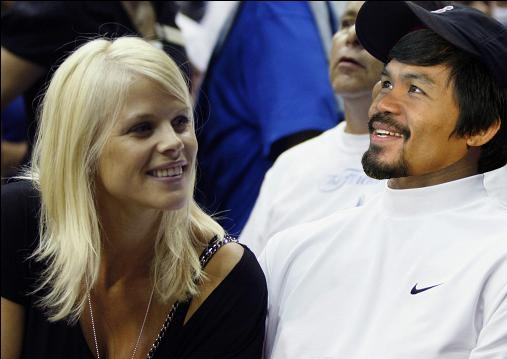 Prior to the fight, Manny went the spiritual route. After years of partying, smoking, drinking and most notably, infidelity, he decided to give it all up and go straight. This brought about what we like to call “The Tiger Woods Effect.” Tiger Woods was the most dominant figure in golf, comparable to Manny in boxing. During that time span, Tiger inconspicuously was “handling” a plethora of women other than his wife. Once Tiger got caught, he had to give up his cheating ways cold turkey. A major slump ensued. Such is the case with Manny. When you are a victim of “The Tiger Woods Effect,” women fuel your success. Manny pledged to give that away and he ended up losing the fight.